Advent Candle-lighting songs and other songs you make like to start looking at as you think about Advent… Updated November 2018. I will keep adding to these as the weeks go by, so check back from time to time. There will also songs for each week of Advent 2018 - see the panel on the right hand side for links (or the Coming Up in the Lectionary tab) as they are updated. *Online Resource An empty bowl, uplifted hands (Bob Faser) Good words for just before the start of Advent, when the Christmas Bowl is blessed, ready for contributions during the Advent season. Sung to the tune WINCHESTER NEW. Lyrics. SP&P088 The Universe is bending (Jeremy McLeod) While not specifically an Advent candle lighting song, I think this could work for such prayers, as it is simple to change just one word every week. Lyrics, sheet music. Online Resource Shine a candle (Lucy Graham) A simple and quite lovely song that could be sung each week of Advent. Free sheet music and notes for bringing the song to life. *Online Resource Kindle a flame within our hearts (Philip Garside) A beautiful gentle song, with lyrics that can be altered for each week of Advent. Sheet music and lyrics. Iona (M&G) / CH359 / MV033 / ZSS54 / StJ / GtG127 / ELW253 / GA293 / SFFS 2085 / G(II)276 / GC370 / GC(II)364 / G(3)429 / CP368 / W&R402 He came down that we may have love / Jesus came bringing us hope (Traditional Cameroon) The translation in "More Voices" (Jesus came bringing...) seems particularly appropriate for Advent and it could easily work as an Advent Candle lighting song. Just sing hope, love, peace or joy, depending on the week. Would be more exciting and energetic with some African drums, rather than a quiet reflective candle lighting song. Lyrics and sound samples. Good for kids. *GA279 / A&M56 / SP019 Word of Justice / Advent Litany (Bernadette Farrell) A good call and response for Advent, with many many verses. Only use a few each week. The cantor says one line, then the congregation respone "Allelulia! ", the cantor again, then "Maranatha! Sound sample. Online Resource Light a candle bright and tall (David Wood) Excellent words to the tune for "As with Gladness"; a new verse for each week and one for Christmas day. I'm thinking we might sing this at home when we light our candles! Lyrics and free sheet music. Good for older kids. Online Resource In twilight's calm and gentle space / Season of Gifts (Helen Wiltshire) Based on the themes of GIFT: Grace Illumination Faith Transformation. Free book download. MV221 I am walking a path of peace (Janet Tissandier) A simple song for a benediction or an Advent Candle Song; words can be altered to paths of love, grace, hope, joy etc. Obligato from Alan Baer. Good for kids. GtG467 / STB058 Give Us Light / Jyothi dho Prabhu (Charles Vas) This song in Hindi or English is simple and repetitive and could be sung in either language (with a little teaching time). You could sing all 5 verses or just a few. It might also work during Advent as a candle lighting song, although you will need to consult with a Hindi speaker to change the lyrics. Online Resource Be still and know (adapted) (Richard Schwedes) An adaptation of the old familiar tune (ATN9) with a verse for each week. Lyrics sheet New words to old tunes. GA272 Maranatha Maranatha Come Lord Jesus Come (Jane Wood) A good, simple Advent chant with some nice verses and prayers to go with each week. VU007 / HPP109 / W&R165 / Cha132 Hope is a star that shines in the night / When God is a child (Brian Wren) A candle lighting song with a chorus sung each week "When God is a child there's joy in our song. The last shall be first and the weak shall be strong, and none shall be afraid". Lyrics. *GC(II)326 Lead Us to Your Light (Carol Browning) Good advent song. You could sing one verse each week, concluding with the final verse on Christmas day. Youtube. Online Resource: Prepare the way of the Lord (Jeffrey Lowery) An upbeat song, good for kids and teenagers, I think. The verses are kind of wordy, but they're good words. The verses follow the traditional advent themes of peace, hope, joy and love, so you could also sing it every Sunday of Advent. Youtube. 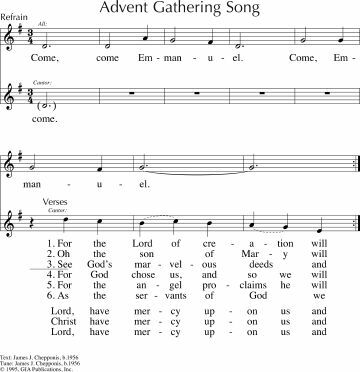 Online resource The Advent candle shines with hope (Jay Padgett) New words for each week of Advent to a nice traditional hymn tune (MARYTON). This would go very easily in most congregations. Best sung fairly slowly. New words to old tunes. Free sheet music. Online Resource Hope is a light (Daniel Damon) A simple and quite nice Advent candle lighting song. Free sheet music. *Online Resource Come Christmas Child (Shirley Murray) A wonderful new song that fits the themes we are exploring this year: that Christ will come amid the pain and hurt that exists in the world (oh, maybe we explore that every year?). The tune is not easy - it will need to be taught, but the lyrics will make it worth the time! Lyrics and sheet music. *Online Resource Drawing Nearer (Christopher Grundy) An excellent contemporary song about the lack of peace within the world and within our souls, and the desire for God to "steal our hearts - like a baby". It's great. Free sheet music. Sound sample (youtube). I would use this first by a soloist, and invite the congregation to join in as they get the hang of it. Online Resource Christ comes again (Barbara Hamm) Very easy to sing, and good lyrics about where Christ can be found in our everyday lives. Lyrics and sheet music. Online Resource Hey Mary! (Sam & Malcolm Gordon) A lovely children's song about the annunciation. It captures the surprise and the universality of God's arrival to each of us. Youtube and sheet music. Good for kids. *Music by Heart 59 Come light of lights (Ruth Cunningham) A lovely two-part chant that would be a nice meditative song for any week of Advent: "Come light of lights into my heart. Come wisdom of spirit into my heart". It can be sung quite slowly and meditatively, or more energetically and joyfully, depending on your context; it can also be split into a round! Two videos: A quick version and a slow version. Sound sample. Good for kids. CH256 / VU424 / GtG765 / StF411 May the God of hope go with us every day (Alvin Schutmaat) Simple joyful song with a focus on working for peace, working with the "God of peace" who fills our lives with "love and joy and peace"; I would sing just the first verse and chorus. A good song for the end of the service; be careful it doesn't get too pedestrian or childish - think of traditional Argentinian music, which is what it is. Good for kids. MV019 Maranatha (Louise Skibsted) This simple chant, simply “Maranatha, Maranatha, Come Lord Jesus, come” might work well if you are having a more meditative approach to the Advent season. We used this in 2013 and 2014 and I'm not sick of it yet. *NCH121 / UMH210 / VU005 / WoV629 / ELW266 / W&R163 / Cha139 All earth is waiting / All earth is hopeful / Toda la tierra espera al Salvador (Alberto Taule) Fun Catalonian tune, good words, although the English translations vary between sources. Could be good for kids. A nice recording from Chile in Spanish. Slow and majestic organ sample and English lyrics. I particularly like this translation. *MV028 / StJ / FFS25 / GC(II)507 / G(3)587 God of the Bible / Fresh as the morning (Shirley Murray) Good words. I particularly like the tune by Alonso, as the chorus is really very wonderful. This is a song worth learning for Advent, but can be sung all through the year. I think this song would be a really good "fit" for our congregation. Sound sample. Lyrics. AoVK-52 O Emmanuel, come into our hearts (Michael Mangan) with 3 verses. In 2008 we sang just the chorus on Advent 1, then added one verse for each week. Verse 1 “We your people are waiting for you..” Verse 2 “ We, your people are longing for you”. Verse 3 “ We your people are ready for you”. Could use a cantor for the verse and congregation join in the chorus. Would be great with good Latin or African percussion. We sang this in 2013 during Advent, and it worked well. Good for kids. *CoC30 Look toward Christmas! (Shirley Murray) I particularly like tune (i); very joyous! A fun song looking forward to Christmas. I don’t know if it would last the distance of singing it every week before Christmas. Quite good for kids. I like the image of the angels flexing their wings! Taize / CH276 / VU22 / GtG090 / ELW262 / GtG090 / GA283 / G(II)256 / GC332 / GC(II)340 / G(3)406 / CP094 / W&R166 / PfAS037B / SP28 / URW396 / Lau088 Wait for the Lord (Jacques Berthier) Wait for the Lord whose day is near, wait for the lord, keep watch, take heart. A lovely simple Taize chant. Sheet music, translations and sound samples. CH784 Come light light of God / Lumière de Dieu (Grandchamp Community) A lovely simple chant. Would be beautiful for Advent candle lighting. Simple harmonies. *MV045 Hamba nathi (Zulu) This is the song we sang during Advent 2009 for the (usually silent) procession at the start of our worship service, and we wrote verses for each week. We sang it in Zulu followed by one line in English on the repeat. Week 1: You are holy, you show us the way. Week 2: Justice is coming, prepare the way. Week 3: Singing and shouting, we're walking the way. Week 4: We're walking to freedom, come join in the song. There are a lot of other translations and variations of this song. I like "Come walk with us, the journey is long". Good for kids. ATFG 514 Emmanuel Carol / God of light we are waiting for you (Gael Berberick) This is probably not one to sing every week, but is definitely worth looking at as a general resource for Advent. Iona (HSNW) / VU019 / A&M839 / SP326 Kindle a flame to lighten the dark and take all fear away (Iona) This song would also work well as a simple candle lighting chant during Advent in the Northern Hemisphere. Sound sample. GC(II)339 When the wind of winter blows (Ruth Duck) Northern Hemisphere-specific Advent song. Best if you live somewhere where it actually snows. GC(II)352 / G(3)442 Gift of God O Emmanuel (Marty Haugen) A nice chant-like refrain and Cantor line. Note that this one needs a cantor. Would be excellent for Advent and then Christmas day. Many verses which can be sung, so choose the most appropriate for your congregation or write your own. Sound sample. Sheet music sample. *HPP216 / GtG092 While We Are Waiting Come (Claire Cloniger) A lovely simple chant of anticipatory praise. GC324 / RS 492 Here in this world where darkness surrounds us / Come O Hope of your people / Advent Gathering (Rory Cooney) Excellent questioning words. Cantor and response. 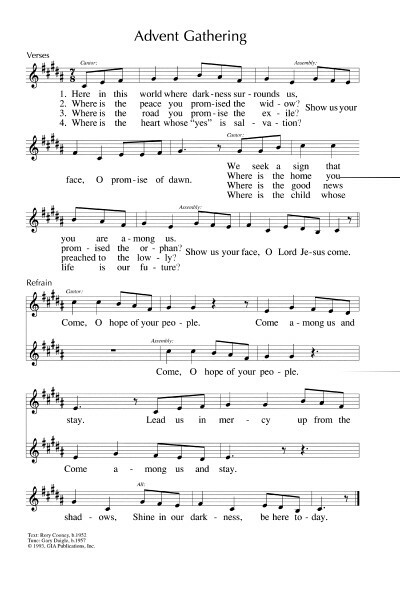 Simple to sing, and quite beautiful "Show us your face, O promise of dawn". It's in 7/8 so it immediately appeals to me.... Sheet music sample. Online Resource An ancient story told (Leonie Percival) New words to the very familiar tune LEONI, inspired by a refugee family within the author's church community. Sheet music. New words to old tunes. *Seeds of Faith Prepare the Way For Love (Richard Bruxvoort-Colligan) A good song for kids. I think it would be fun to make up additional verses for this one so it could carry through the whole of Advent. Sound sample. BUC people, I have this book. Good for kids. Tune In: Dare to Dream (Elaine Loukes) A great song about having a vision for the future, being lead by the light of Bethlehem’s star. "Dare to dream of new beginnings, Paths untried, by faith supplied". Free downloadable songbook. STB268 / VF033 The grain is ripe (Shirley Erena Murray) Hopeful words of harvest, sung to a familiar-ish tune. It has some tricky timing, so be clear when you lead it. URW424 Come Lord Jesus (Carey Landry) An extremely simple chant that could be used in Advent. CH281 / UMH202 / VU009 / WoV626 / LBW626 / ELW248 / A&M47 / HPP83 / GtG105 / PH012 / G(II)337 / GC318 / GC(II)337 / G(3)409 / CP091 / CP(E) 35 / W&R161 / Cha142 / SP015 / VF034 People look East, the time is near (Eleanor Farjeon) Bouncy and joyful Advent song. Note that it is cold-climate Northern Hemisphere specific. *Iona / VU33 Watch watch and pray (Iona) A very short Advent chant; could be used at various times during the service, maybe even during intercessions. Also has lyrics specific for Maundy Thursday. Music by Heart 63 Tar a thighearna (Ruth Cunningham) Advent A simple and beautiful chant based on ancient Celtic words meaning "Come Lord, come thou Being". Youtube. AoV2-123 / AoVK-59 Twilight then darkness (Phil Porter) A lovely Advent candle song, which could be good for Northern Hemisphere people. In the Southern Hemisphere, you could possibly use this at dinner time, if you live closer to the equator than me. Darkness comes pretty late in a Melbourne Summer. We don't usually have a choir at Brunswick, but we often pull one together at Advent. Here are a few choral ideas. Online Resource There is a yearning / The Yearning (Craig Courtney) This is quite beautiful, and will appeal to a range of congregations, as it can be interpreted quite broadly. It has arrangements both for SATB and TTBB choirs. Sheet music & sound sample. 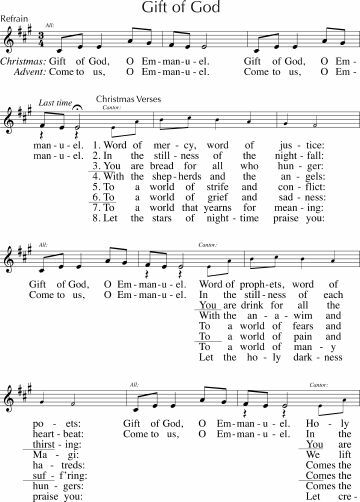 Online Resource Light of the World (Laura Daigle) I quite like listening to Laura Daigle sing this, and the choir arrangement looks quite manageable. Sheet music & sound sample. Do you know 'Star Child, Earth Child' by Shirley Murray? It's a lovely advent song. It's in a New Zealand hymn book called 'Carol our Christmas' available from The New Zealand Hymnbook Trust. It's in other hymnals now as well but I don't have a list. The last line of the chorus is "This year, this year, let the day arrive, when Christmas comes for everyone, everyone alive". Maybe you already know it. This year for the candle lighting, we will be singing VU34 "Come Now, O God of Peace" substituting "hope," "joy," and "love" for peace on the different weeks. It is a Korean melody (O-So-So) and very haunting to my North American ears, so fits well with a contemplative candle liturgy. Also - When the Wind of Winter Blows is also found in More Voices - MV7. I love this song, but I don't know if we have enough singers in the congregation to learn it in time for Advent this year.